and you will learn how to treat them on this page! For example, Christina Ricci has prominent, deep set eyes. A lot of people tend to think of prominence as equal to bulging, but here we classify that as protruding. This is because your eyes can be big, and yet sunken and dominating at the same time. People with these eyes tend to not be able to hide it when they're tired, or overly emotional because those eyes just take on most of the expression involuntarily. There's no proof of this, just what I've personally observed. 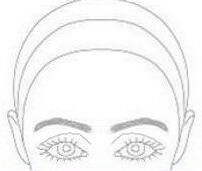 The size of your eyes influences the thickness and size of your brows. Your eyeshadow patterns depend a lot on the space between your eyes, and on whether they protrude, or are sunken. So if you have big eyes, you also have to determine the other attributes that come with them, and go with the makeup that suits that eye type. 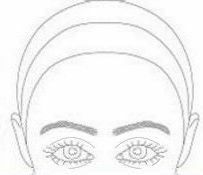 For more in-depth advice, visit the other eye shape pages that describe your look according to the space between your eyes, and the position in the eye sockets. One color, and horizontal eyeshadow patterns will look awesome on you... The traditional method with a dark color on your crease might make you look a little beat up. So try on your favourite colors horizontally first. Horizontal patterns will also look good, while traditional will also add more dimension to your eyes. So placing a darker color on your crease will give you a deeper set look. Stay away from very long lashes and highlighter. Long lashes make the eye more open. This can leave you looking permanently surprised and a little overeager. Shimmery colors will make the eye look like it's bulging out a lot more. The space between your eyes will have a bigger impact for you than for others with small and medium sized eyes. So really know what it is and choose your colours appropriately. If you're still not sure which eye shape you fall into,check whether you have prominent eyes or not here!